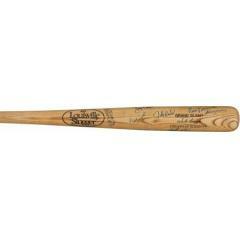 Offered here is a solid, multi-signed baseball bat, featuring an array of Red Sox legends (and a couple of Yankees). This is a 34" Wade Boggs model Louisville Slugger Bat with the a number of great signatures, including: Bob Doerr, Wade Boggs, Chris Chambliss, Clete Boyer, Johnny Mize, Bobby Murcer, Jim Piersall, Johnny Pesky, Jody Reed Rico Petrocelli and others. Mint Condition signatures displayed in blue marker. This bat comes with a Full Letter of Authenticity from James Spence Authentication. Due to the rare nature of this bat we must charge your credit card for the full price immediately upon taking your order. This policy ensures we reserve this bat for you. We will confirm your order by Email. This bat is not game used. Please allow at least 2 weeks for delivery. Boston Red Sox Stars Signed Bat $695.00 Sold Out!